If you’re new to the beef jerky game, you might not realize that the cut of beef you choose will ultimately determine your jerky’s flavor and texture. When it comes to making quality jerky, not all cuts are created equal. Cows are broken down into nine primal cuts: chuck, rib, short loin, sirloin, round, flank, short plate, fore shank and brisket. From those nine primal cuts come a whole host of smaller cuts that you’re probably more familiar with, such as tri tip, tenderloin, ribeye and T-bone. With so many cuts to choose from, it’s understandable that you may not know which is the best meat for beef jerky. Don’t worry… we’ve learned a thing or two in our 20-plus years of making jerky – and we’re more than happy to share our jerky wisdom. 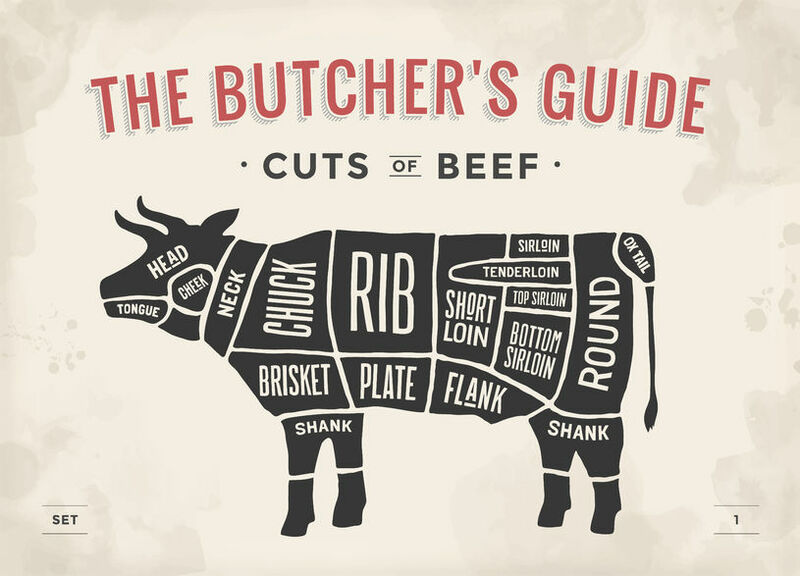 Is There a “Best Cut” of Beef for Jerky? Yes and no. There is no single cut that is “best,” however there are specific qualities that make some better than most. When it comes to the best meat for beef jerky, the leaner the better. At Mountain America Jerky, quality and freshness are our top priorities. That is why we only use the freshest cuts of top and bottom rounds from our Colorado cows. We do this because we know that the most tender, lean cuts of beef give jerky the best flavor and texture. While you can use cheaper, fattier cuts of beef with more marbling, you’d be sacrificing the quality of your jerky. A lot of commercial jerky makers use these types of cuts, which are made more palatable by using fruit juice to break down the fat enzymes. This process tenderizes the fat but doesn’t always get rid of all of the grizzle. Top round and bottom round are lean, flavorful and – in our opinion – the best cuts of beef for jerky. Sirloin tip is extremely lean, but not as tender, and a bit more expensive. Flank steak is also lean (though you may need to trim some fat) and flavorful, but can be tough if its sliced with the grain. While all of these cuts make for some great beef jerky, limiting yourself to only beef can be… well, limiting. Don’t get us wrong: we love beef jerky. But we also like to take a walk on the wild side from time to time. The wild side of jerky, that is. Exotic meats, like grass-fed Tibetan Yak, are perfect for jerky. Ultra-lean and similar in flavor to beef, yak jerky is definitely a game changer. If you’re more of a white-meat person, alligator is an excellent jerky option. Ever try kangaroo meat? These friends from down under are extremely flavorful – and leaner than chicken! And of course, wild game such as venison, buffalo, elk and boar are always great jerky options. May we recommend ostrich for the next time you jerky?